It was quiet . . . TOO quiet . . . It was hot, too . . . TOO hot . . . and getting hotter . . .
At this time of year, the streets of Kew – even the arterials – are so deserted that most of the time you could fire a shotgun and only hit an Indian myna. In my side street, more than half the neighbours are away – at the beach, wherever – who knows? Anyway, it’s really really quiet. The Pub’s been a bit quiet, too. Doesn’t matter; people are more than welcome to sit in a comfortable nook and think their own thoughts. It’s a good time to contemplate. “Normal” life will resume soon enough. So you are all welcome to chill here, and be lazy with me. Just remember . . . if moi is asleep . . .
What does keenan mean when he talks about ‘mitigation’? I’m not sure. At the surface I think he might be talking about burning off. But it might just be that the LNP don’t want to take responsibility for disaster relief and are looking for a way to explain it away as a lack of preparation. It seems futile that the lady’s friends are holding the “veils of modesty” to shelter her from (presumably) the lecherous gaze of mustachio twisting males, when the artist is there in front of the whole scene!…and us too! That’s different. See, the artist is a bit like a statue. He doesn’t look at these women with “the lecherous gaze” – just as an artist, detached from his models. As for us, we don’t count as we are invisible and not in situ. Abbott’s lousy Productivity Commisssion apparently recommended money be spent more on preventing disasters than on rebuilding after they occur. I think what this all means is the feds will make disaster recovery payments the responsibility of the states and will claim they are working on ways to stop disasters occurring. That will mean government funding that once went to help people rebuild being diverted to various Liberal-friendly organisations to run lengthy studies that, in a few years time, will tell us all the bleeding obvious. You can’t do much to prevent floods, fires or earthquakes. Rotten to the core – corruption in the highest places. Kaye Lee for AIMN – Gina’s web. Ah!..a thousand blessings to you Gigilene…you have restored the “innocent” in me…and I thought for a moment (just the slightest!) that here I was “perving”. I’m sure you are a bit, just a bit …But don’t forget they’re virgins – so no touch! Thanks. I wonder how they are going to ‘mitigate’ droughts, floods, lightening etc., no one else in the world has ever been able to stop nature, but apparently they think they can. As Leone has just said, it will their excuse for not helping people when disaster strikes through ‘acts of god’. Everyone for for themselves, and they’ll continue to very generously line the pockets of all their mates. Gigilene..It’s not in my nature to get offended, but I’ll have you know that like many a young man, I learned the difference between “perving” and the appreciation of high art standing, studying for much time before that tall, firm, statuesque bronze of “Circe” in the National Gallery ! And I didn’t overstay my “welcome”..( If you look closely at the plinth there is a miniscule plate stating the recommended time for males between certain ages to linger!). Anyway..I doubt if I had offered to paint the youthful bod’s of Rhonda Bletchley or Meg Forbes down on the bank of the Merri Creek would’ve been seen as “detached” !….particularly since the only brush I coulda’ got hold of was the old man’s 4″ er and perhaps his roller and tray! 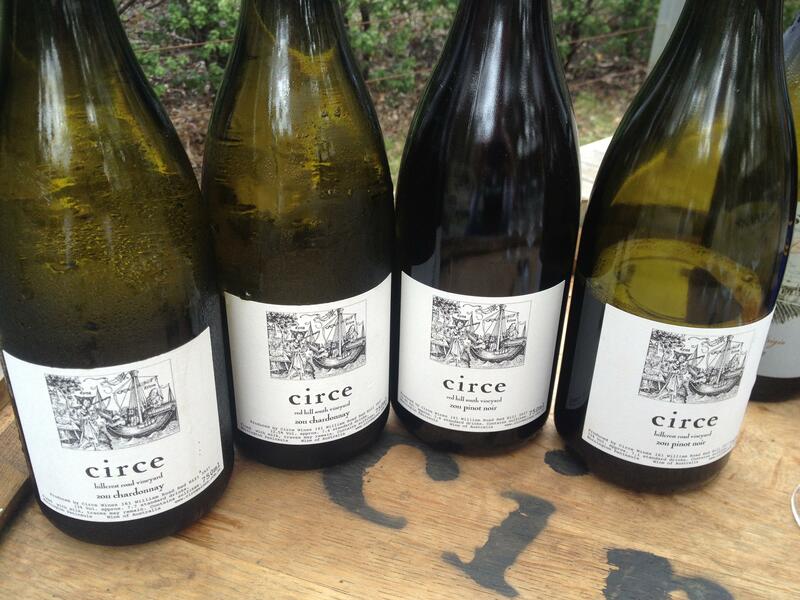 the name was chosen for the wines as “a nice metaphor for the seductions – and perils – of Pinot Noir. Just look who was involved in the protest! Jackie Kelly! She is more concerned about winning a seat in the NSW election, where she will run as an independent, than about the fate of the Blue Mountains, I think. The Department of Infrastructure lodged a scoping document with federal environment bureaucrats in December that claimed a significant impact on the World Heritage values of the Blue Mountains was “not considered likely”. But the Environment Department ruled on December 23 that World Heritage impacts must be examined, after protest submissions by environment groups and the former Howard government minister Jackie Kelly. The answers from this mob are dams, pre-emptive logging, and sheep’s bladders respectively. Re ‘mitigation’ – often I think the main role of this government is to find ways of talking about issues that sounds like action but is in fact inaction. The current talk about not burdening future generations with debt is just the development of a false problem to which they can provide false solutions. The ‘age of entitlement’ talk served the same purpose. And it sounds like ‘mitigation’ is in the same ballpark. The ‘solutions’ always seem to involve shovelling money at their rich friends in some way, while withholding money from those who really need it. I don’t think the LNP are really concerned with how all of that is supposed to play out economically. Everyone outside their immediate orbit appears to be a non-person to them. To summarise, all this regime is capable of is Orwellian Doublespeak. Those who say they’re just the political arm of the IPA are onto something, Fiona. But I still wonder what’s going through the heads of their backbenchers. I’m sure they realise they’re being sacrificed by a leadership team who don’t care what happens beyond this term. Why on earth are they putting up with it? I suspect abbott, morrison, cormann, abetz and maybe even robb see themselves (and are getting their jollies) as the generals, barking out the orders on the field telephones. The backbenchers – well, some of them – are beginning to realise that they are mere cannon fodder, and that when the order comes to “go over the top”, No Man’s Land will not be a pretty site. It is VERY rare, however, for foot soldiers to mutiny. What with it being the Gallipoli centenary and all let us hope that one of their middle ranks follow the example of Lieutenant Colonel William George Malone who following a “disastrous attack ” in full daylight by another unit upon receiving orders from the high and mighty said get furcked……………………………..
Malone was ordered to continue the attack. He refused: ‘I’m not going to send them over to commit suicide.’………..Malone, the citizen soldier impatient with the incompetence of British regulars, has come to symbolise the New Zealand experience at Gallipoli. He is commemorated by a memorial gate and statue at Stratford. He and his men did it his way and did it easy. It has taken me two whole days and a bit to realise (1) that, and (2)where I had stuffed up the html in this post. The problem should not recur, as I have amended the doc with the pictures and captions html. Thank you VERY much for dispensing your anti-italics powder. Zero mention of The Oaf arriving in Iraq in the SMH and the GG front page. Virtual failed state meeja better than ours. There was a mention of Abbott’s trip to Baghdad just after Christmas, but not in our media. Nothing here has said a word about it. Why? I had begun to think this was just a false report. These are very expensive trees. How many will survive? Video footage of Tone’s arriving in Iraq has surfaced. No wukkas, Tones, a bowl through Baghdad on your bike’ll be a breeze! 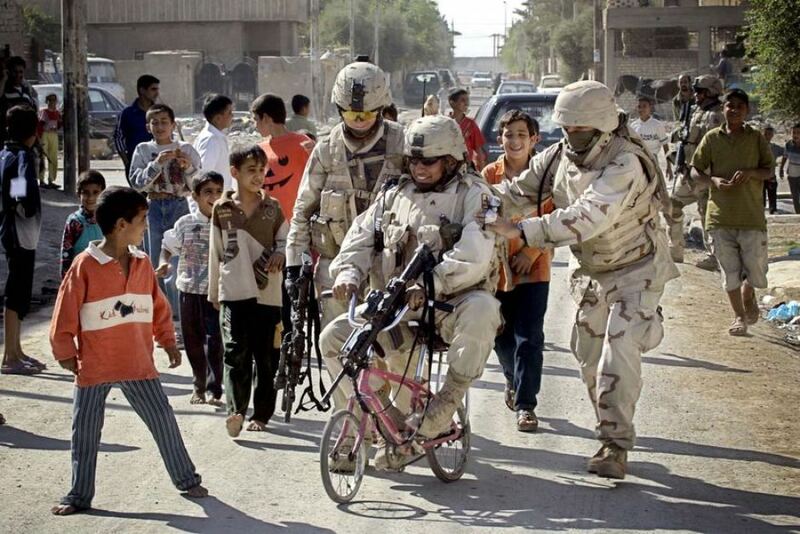 Tones bike ride in Baghdad . Well, we already knew the GLG had told Her Dear Leader to go ferret, but it’s so nice to find myself surrounded by similarly warped like-minded people.